The recipe box holds standard 3″ x 5″ index cards. Colors are red, white & tan. Design includes a grinder, coffee pots (a couple different ones), hanging kitchen utensils, various fruits, pots and pans, and salt and pepper shakers. The box measures approximately 5 1/8″ long x 3″ deep x 3 3/4″ tall. These recipes came from Shelby Ohio Richland County (Shelby, Richland County, Ohio) estate of a veterinarian we cannot remember his name we are going to ask the auctioneer that done the sale and see if he has the family’s name and when we find out we will sure let you know. which contained 8 vintage recipe boxes made of wood and tin. 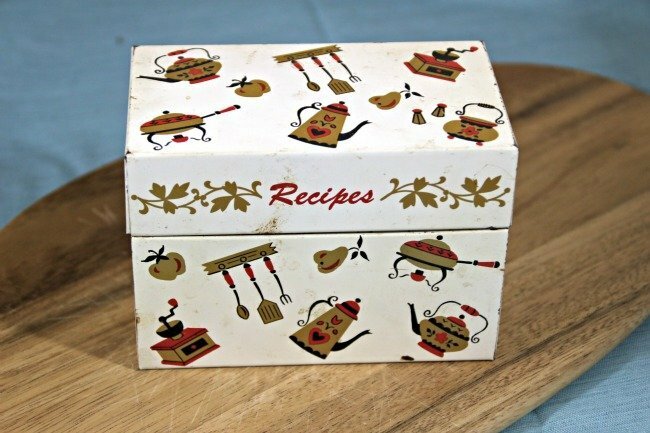 Below are links to view the other vintage recipe boxes purchased within this recipe box lot. Based on the clues in the box, I believe the owner was Merridelle Ruth DePUE Sowers who is the daughter in law to Goldie LEWIS Sowers. Persons mentioned in this recipe box and their contributions to the recipe box are listed below. Information for each person was found using Ancestry.com. As you can see, the owner of this box collected a lot of recipes from family and friends. Mrs. Lanker was Adelaide Olson who was born in New York in 1919 and at some point in her life moved to Ohio, where she passed away in 2001. I do not see a relation to the original owner of this box. She was baptized at the Bethany Lutheran Church in New York in 1920. Her parents and older siblings were born in Norway and it appears she was the first Olson born in the United States. I found records on Ancestry that show she was a Navy veteran during World War II! Corrine was born in 1918 in Ohio and passed away in 2002 in Ohio. She was the wife of James W. COE and the daughter of Harvey Carl GREER and Lelah C. NICHOLS. I wonder if this is Reverend C. David Wright, husband of Mirian listed below. I have no other clues to who David could be. At this time I do not see a relation to the box owner. Doris was born in 1904 in Ohio and passed away in 1992 in Ohio. She was married to Clarence HESSLER and what the daughter of George SCHWAB and Olive May BORDNER. Elsie was born in 1914 in Ohio and passed away in 2005 in Ohio. She was married to Theodore Frank STOCKMASTER and was the daughter of James Phillip DAWSON and Mabel Fern COX. 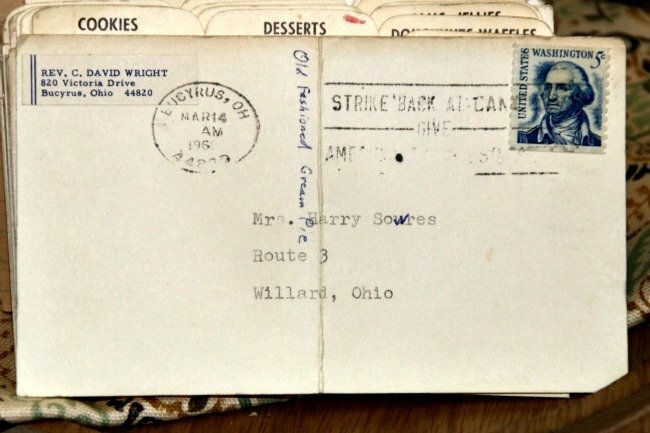 She is the owner of Vintage Recipe Box 001 and the mother of Dr. Harry Lewis SOWERS, who married Merridele DePUE. I THINK this is Betty Jean RHINEHART. If so, she is the daughter of James Harold RINEHART and Mary Ada BROCKLESBY. James was the son of Silas C. RINEHART and Emma Della QUAY, who were Merridelle’s grandparents. This would actually make them cousins, and not niece / aunt. I will continue to search to see if I missed a Jean or if I am wrong about who the owner of the box actually was. On the meatloaf recipe, there is a notation of (Sister) (Jean) which makes me question if there are two Jean’s (one a relative and one from church) or if they are the same person. Jean Elizabeth HANSMANN Fulton is the wife of Joseph Fulton. Jean was born in 1928 in Ohio and I have not found further information on Jean. I wonder if there is a connection to the family and this is who they call Aunt Jean or could she be Sister Jean. I believe this is the Joe Fulton I found from Willard, Ohio and is not related to the original owners of this recipe box. You can find gold and red recipe box made by Ohio Art Company on Etsy.